HARLOW, England, Jan. 25, 2019 /PRNewswire/ -- Haag-Streit UK (HS-UK), the leading manufacturer and distributor of gold-standard optometry and ophthalmic equipment, is delighted to confirm that Haag-Streit Academy will be hosting an Ophthalmic Ultrasound & OCT-A Course at Crewe Hall, Cheshire on Thursday 11th April, 2019. The course is aimed at those working with ophthalmic ultrasound in their daily practice, and will cover both A-scans and B-scans, including how to capture them. Lectures will describe some of the common conditions observed using ultrasound, such as; retinal detachments & tears, vitreous haemorrhages & detachments and optic disc drusen & other dot lesions. The day will also include a lecture covering the detection of ocular oncology with ophthalmic ultrasonography. In addition to ultrasound, the day will also cater for those using OCT-Angiography (OCT-A) in medical retina. There will be an introduction and explanation of this exciting approach to imaging and an exploration of the clinical applications of OCT-A, including CNV, diabetic retinopathy and glaucoma. 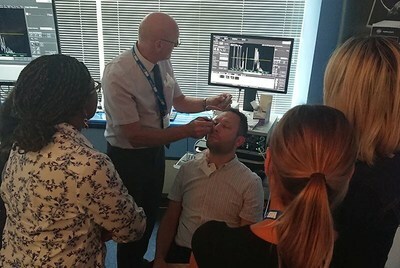 The expert Faculty includes Tarek El-khasab, Consultant Ophthalmologist & Lead for Ophthalmic Ultrasound Services at Mid-Cheshire Hospitals NHS Foundation Trust and Grant Duncan, HS-UK Clinical Training Manager. The one-day program consists of short lectures by the expert speakers, followed by hands-on practical workshops in both OCT-A and ultrasound. Delegates will be able to claim 5.5 CPD points for their attendance on the day. The meeting offers an excellent opportunity for delegates to network with their peers and a home-cooked lunch is included in the price. Grant Duncan, HS-UK Clinical Training Manager, said, "Haag-Streit Academy look forward to welcoming delegates to this popular course. We are delighted to be working with Tarek El-Khashab again to deliver the course as delegates will be able to benefit from his in-depth expertise and knowledge of ultrasound techniques."